Where there’s smoke, there’s fire, but the point should be debated in regards to Prometheus, Ridley Scott’s return to science-fiction almost 30 years after Blade Runner. A splendour to behold, from the panoramic views of desolate Icelandic terrain to the imaginary landscape of a planetary moon with the unromantic designation of LV-223, Prometheus achieves the epic visual presentation one associates with the grandest of science fiction and fantasy films. Every scene is lavish with thoughtful design, whether in the muscularity of the titular spaceship, the organic morphology (both biologically and technologically) of the alien race dubbed “Engineers,” or the creature design. Dariusz Wolski’s cinematography is rich and atmospheric. Performance-wise, Michael Fassbender just about carries the film in his pocket in his role as an inconsistently characterized android with a duplicitous agenda and ambiguous relationship towards humanity. It’s all beautiful smoke, but where’s the substance? Some fuss has been made about the film’s narrative ambiguity. Though certainly not perplexing in the mode of Stanley Kubrick, the ambiguity is earned fairly. The narrative offers a credible sense of mystery by leaving obscured much about the Engineers except for facts that directly impact the literal aspect of the story, and using whatever answers are offered to set up new questions. Yes, the invitations has been issued for a sequel, but the film accomplishes enough that whatever direction the series takes – in a potential follow-up possible titled “Paradise” – will build on Prometheus instead of charting the same territory. So, no, a lack of answers is not the reason why the old syllogistic adage is wrong and the film lacks fire, a mortal wound in a film so intimately vested in the myth of Prometheus’ theft from the gods. It’s the lack of science and scientific reasoning, in a film ostensibly framed as science fiction, that reduces Prometheus to a false alarm. As if Scott and his screenwriters, Lost’s Damon Lindelhof and Jon Spaihts, had never read science fiction let alone familiarized themselves with how scientific research is conducted, Prometheus gives us a scenario of often astonishing incompetence. 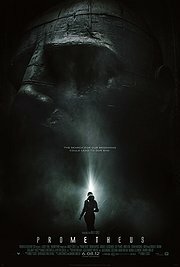 Beginning with the scientists, Prometheus gives us a geologist unable to tell the difference between natural and artificial formations, a biologist without curiosity about alien life forms until the moment the narrative demands a grisly sacrifice, and assorted crew members who serve no discernible purpose. What little scientific method there is consists of reading computer screens. The only facsimile of science occurs at the beginning of the film, when archaeologists Elizabeth Shaw (Noomi Rapace) and Charlie Halloway (Logan Marshall-Green) discover a cave painting that would make Erich von Daniken proud, and even that is little more than the sort of stumbling around any amateur adventurer can do. Do Scott and co really imagine that this is how a trillion-dollar voyage to another planet would be carried out, by a defenseless spaceship filled with unarmed scientists who blunder around? What are we to think of a script that succeeds in having characters get lost in relatively simple tunnels despite having access to maps and guidance from the ship? I half expected Scott to cut away to the two technicians from Cabin in the Woods, gleefully punching buttons on a console to orchestrate a sacrificial ritual for the appeasement of an elder god audience. No such luck; the only explanation for a poorly conceived scenario populated by incompetent and often outright stupid characters stems from the unmarried marriage counselors (to borrow a phrase from Charles Schultz) who wrote the script. The film’s most notable act of intellectual dishonesty, as if implausibility wasn’t enough, is that while the script asks big questions it settles for small, unexamined answers. There is no debate or discussion about the questions, the answers, and the significance of either beyond the banal reevaluation of human origins as extraterrestrial in nature. Prometheus doesn’t feature scientists flinging evidence in support or refutation of the various scientific hypotheses that arise from the archaeologists’ discovery, or arguing the implications of challenges the body of evidence that favoured human evolution from primates. That the film stops short of providing definitive answers is not the problem, provided that we can share in the characters’ thrill of puzzling out the mystery and pondering the possibilities. Problematic is that the film’s protagonist, played by Noomi Rapace with strength and vulnerability worthy of Sigourney Weaver’s Ripley, demonstrates a markedly anti-scientific mode of reasoning: in the absence of evidence, her conception of knowledge is informed by what she chooses to believe. Instead of accepting the unknown as unknown, she emphasizes the film’s equivocation of truth and wishful expectations, with the only nod towards the false equivalency emerging when the expectations are fulfilled in a predictably brutal fashion. In regards to the film’s implications in terms of the human condition, Prometheus makes the mistake of forcing a simplistic religious perspective on a non-religious paradigm of human origins despite the ill fit. As if centuries of theology, philosophy, and science have no bearing on the characters or issues, all we get is the view that the created somehow must derive the meaning and purpose of their existence from their creator. Imagine the problem, then, when discovering that the creator is not the burning bush but aliens with sinister secrets. But again, don’t expect the characters to engage in any meaningful debate as one would expect from people confronted with an awesome, unsettling revelation. The extent of the film’s shallowness extends to the wasted casting of Guy Pearce and Charlize Theron, both of whom play important characters that could have imbued the narrative with significant momentum had they been given the necessary screentime to dramatize the film’s subtextual concern with the fear of death. There are irritations, such as the easy exploitation of female anatomy for body horror – a predictable extension of the not-so-vaguely sexual terror implicit in the phallic-shaped creatures, the oral penetration method of infection, and unnatural procreation that marked the Alien films. Yet Scott is a masterful director, so the objection only comes after the scene has passed and the mind can assert itself over the harrowing, visceral queasiness of the expedition inevitable succumbing to horror. The same can be said of the film as a whole; grandly cinematic and relentlessly captivating during its running time, but whose effect is too ephemeral to leave anything behind other than intellectual bankruptcy. Beautiful smoke from chilly embers. A housekeeping note: For anyone wondering about the connection with the Alien films: there is indeed a strong link which marks Prometheus as a prequel of sorts. The film’s revelations provoke a reevaluation of the Alien mythology, but since it has no bearing on the narrative of any of the Alien films, the link isn’t a necessary one to understand. I didn't see it but of the reviews I have read, yours is the most trenchant. Your observation that "the created somehow must derive the meaning and purpose of their existence from their creator" is worth further examination as it goes to the root of modern religion and religious philosophy. One would think that an important issue to mine if one were interested in creating a thought provoking film. Instead, it apparently becomes a wasted endeavor. It seems that popular understanding of religion is so shallow that only the most superficial aspects can be approached. Given how hard scientists tend to be atheists or objectivists, using this structure to discuss religious issues seems considerably less than ideal, even when one has fleets of technical advisors at easy disposal. Instead our great directors end up creating spectacle to serve questionable purposes (i.e. Nolan's The Dark Knight Rises). I look forward to your thoughts on Samsara. Upon reflection, I'm considering Monty Python's Life of Brian to be the most thoughtful Hollywood film to date on the nature of religion. I think the structure could have handled the religious issues if the script had the courage to take a hard science stance instead of pandering to religious sentiment. Unfortunately, atheism is taboo even in films when the subject matter demands it. I agree with you about Life of Brian. Interesting you should mention The Dark Knight Rises. I'm working on my write up but have had little time to finish it. Soon, I hope. As always, thanks for your thoughtful comments!